We have been working with Tommy Dalton over at Root Level Design for close to six months. We are extremely impressed with their knowledge and high quality multimedia services, so we asked Tommy to write an article for our readers. When Silverlight (formerly Microsoft Sparkle) began to surface in April of 2007, it was hailed as Microsoft’s “Flash Killer”. As a 9 to 5 Flash designer and developer, this got my attention. I ran out to grab my copy of Expression Studio and got ready to experience the awesome power of the application that was going to change the way I create! Well, I wasn’t exactly blown away. But unlike most heavy Flash/Flex users, I actually like Silverlight. I see great potential with Microsoft Silverlight Streaming in RIA’s (rich Internet applications) and think it’s a fantastic platform for designing stand alone Windows applications. The interface and tools are similar, which isn’t surprising as both applications are used to create similar content. I found I could basically use my same workflow and spent some time building simple applications similar to ones I had developed in Flash to compare performance. For the simple tools I created, I didn’t really find one application more suitable than another. I do think the coding language flexibility offered by Silverlight is great for developers who are fluent in C#. Assuming other people were asking the same questions and testing the plugin, I set out to find other examples and stumbled on Terence Tsang’s Shine Draw project. This is the best repository of side by side comparisons I have come across and a must see for RIA developers. Terence also posts his source files for each application which are great tutorials if you are new to Flash or Expression Studio. So, Silverlight is pretty impressive. There are a few specific projects I would prefer to develop as stand alone Silverlight powered applications over Flash executables. That being said, I don’t recommend using this technology for web delivery due the simple and overwhelming accessibility drawbacks. It comes down to ubiquity, and until Silverlight penetration reaches a respectable figure, Flash is the obvious RIA route. At the time I’m writing this article, Adobe reports Flash Player Version Penetration for Flash Player 9 at 98.9% in mature markets. After MLBtv dropped Silverlight for Flash, several articles were floating around with Microsoft representatives claiming that Silverlight was installed on 50% of internet enabled machines. Although I think the Adobe figures are probably closer than Microsoft, I think it’s best to look for accurate ubiquity statistics anywhere BUT Microsoft and Adobe. Where do you look for these numbers? Stat Owl, ZD Net, or CNET. How about on your site? Visit RIA Stats and install a simple script that will collect Flash, Silverlight, and Sun statistics from every unique browser that visits your domain. For now, my company will recommend Flash and Flex RIA development to our clients. Whoever is developing content for ABC, A&E, Cartoon Network, CBS, CNN, ESPN, Discovery, Disney, FX Networks, MGM, MLBtv, MTV, Starz Encore, TBS, Time Warner, TNT, TruTV, Turner Broadcasting and Viacom, seems to agree. Although Silverlight seems to have an advantage over Flash delivering streaming media, all of these media companies are using Flash to stream video. What about MSNBC (the MS is for Microsoft)?. 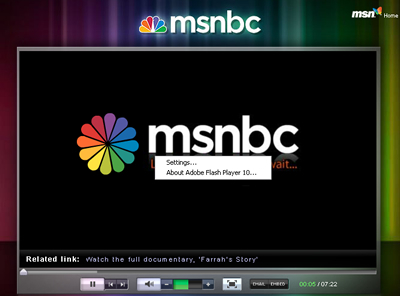 Surely we’ll get to see Silverlight in action by clicking on a video link from the MSNBC home page…wait…really? Good Stuff Tommy and thank you! We appreciate the “real world” review from a seasoned professional. If you are looking for multimedia services, please do not hesitate to contact Tommy Dalton of Root Level Design. Root Level Design provides custom multimedia components and professional media services for projects incorporating Flash design, web and application development, PHP/MySQL development, video editing and post-production services (high definition | standard definition | broadcast | streaming web delivery), motion graphics and polished video effects, DVD and Blu-Ray authoring, 3d modeling, 3d animation, 3d rendering for HD,SD, and web, 3d vector rendering, interface design, kiosk design, search engine optimization, and projects that require comprehensive audio services. Root Level Design is based in Chicago, Illinois.